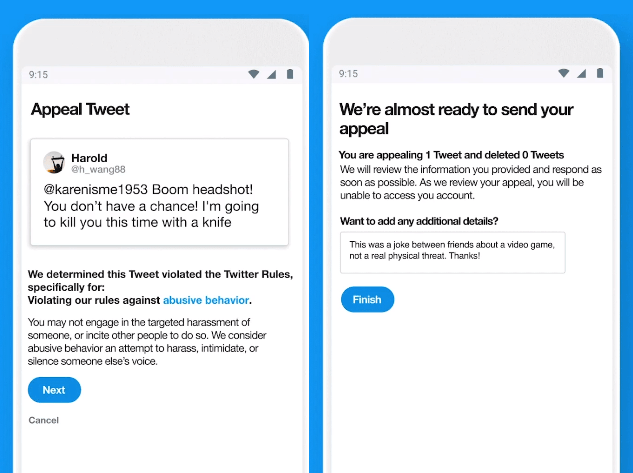 Twitter has added an in-app appeal for reported tweets. “We move quickly to enforce our rules, but sometimes we don’t have the full context and can make mistakes,” the company tweeted. Sometimes Twitter users report other users with malicious intent. And sometimes a reader can misunderstand the context of a tweet. For faster appeals, the company rolled out an option to do it within its mobile app. This was only available through an online form before the update. The flow starts with Twitter informing the user if he or she has a reported tweet. And the notification contains the community guideline allegedly violated by the user. To clarify further, Twitter will include links to documents pertaining to the rule you violated. Then, you can opt to delete the tweet or make an appeal by selecting Start. The first option is to remove the tweet and restore access to your account. This is the quicker and most common response. If reported, most users react quickly to delete the tweet in question and move forward. If you think you were taken out of context and want to fight for your tweet, you either have to go fill in the online form submit an appeal through the mobile app. Tap on the in-app appeal link. 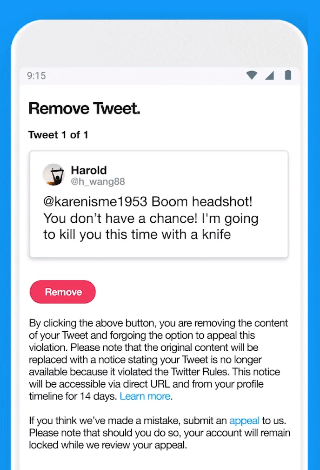 In the next screen, you get a screenshot of the tweet in question. And it has a description of the rule allegedly violated. Tap Next and you will arrive to the appeal screen. Then, you can submit your explanation for the tweet. Twitter says that the in-app appeal is faster to process for the company’s moderators. And users can regain access to their accounts 60 percent faster than before. Regaining access has been an indefinite waiting game. A former Facebook moderator blogged that sometimes users get upset with how long moderators are handling their appeals. Your appeal might not be as significant as the other thousands of appeals received by the hour. That was in 2013. Facebook has ramped up moderation since then. And so has Twitter. Yet, it gives us a glimpse of the issues these teams have to deal with every day. Minor violations are always less urgent. Social networks are responsible for enforcing their rules and employ enough people to manage them. But if your issue is less important, they will push it down the queue.